Born out of the industry in 1999 by a local Hatton Garden family-run business, we are an Academy providing pioneering jewellery education and training programmes that nurture creative talent and technical ability. The British Academy of Jewellery aims to be a jewellery school where technical training is not an afterthought. Where technical skills are not seen as a hindrance to creativity, but where knowledge acquired by the hands provides inspiration. Aspiring to be a school where students do not shy away from originality and creativity and where traditional techniques are taught to then be challenged. Responding to industry needs, we seek to provide the next generation of skilled jewellers who possess the aptitude and ingenuity to shape the future of the industry. With bases in London and Birmingham, we work closely with industry, government and education partners with hopes to build a support network to help sustain the growth of the jewellery trade and other creative industries within the UK. We create opportunities for business, for individuals and for the industry, we support new start-ups, we link designers with manufacturers, and we foster sustainable business growth, training over 600 learners per year in all aspects of the trade and adding jewellery businesses to London's economy, we are the only jewellery manufacturing dedicated training provider in the south of England and Hatton Garden. The Academy also engages with the local community, working with some of the most deprived community groups in London, providing opportunities for people to return to work and enter the trade. The Academy does not operate ‘term time’ only training. We are open all year, providing a variety of options for learning, be it during the day, evening or weekends. No less than you would expect. Until now, we have been a well kept secret, and yet have achieved a number of awards and accolades which include; Queens Award for Enterprise Promotion 2006 (Jason Holt – Founder of the Academy), UK Jewellery Awards for Retail Innovation 2005, London Business Awards Commitment to the Community 2004, London Enterprise Competition 2004 and National Training Awards 2002 amongst many others. In short, we deliver world-class training using world-class resources. 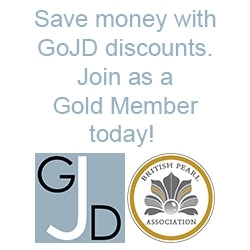 British Academy of Jewellers are happy to offer the GoJD Gold Members 10% discount on any Short Course or Master Class. The discount should be mentioned at the time of booking, is not valid in conjunction with any other offer and can be used against courses only (not valid for the Scheme or workshop rental etc).